When people think about the fate of the rainforest, many have a tendency to worry about tropical rainforests first. Few are aware that many of the world’s temperate rainforests are in similar danger. For example, did you know that Vancouver Island’s productive ancient rainforests are being destroyed three times faster than Brazil’s Amazon rainforest? That’s why this month, as Brazil’s new president Jair Bolsonaro acted immediately to remove protections for the country’s rainforest after taking office in January, Sierra Club BC called for increased protection of globally important rainforests—in the Amazon, on Vancouver Island and beyond. The protection of the world’s rainforests, their spectacular biological diversity and the rights of the Indigenous people living in them is a global concern. So too is their role for clean air, clean water and a stable climate. And now, worldwide concern about the future of the Amazon is growing as President Bolsonaro has declared he wants to open large areas of the rainforest for extraction of natural resources and limit further protection of the lands of Indigenous peoples. As of 2018, about 80% of Brazil’s Amazon rainforest remains intact (compared to pre-1970). In the last 25 years, close to 10% of the rainforest was destroyed (3.7 million square kilometres remained in 1993 and 3.3 million square kilometres remained in 2018). 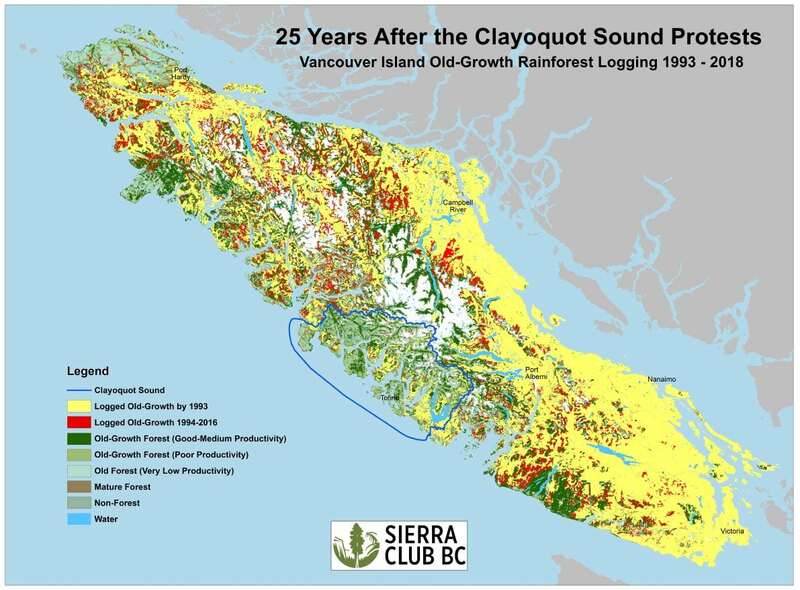 On Vancouver Island, only about a fifth of the original productive old-growth rainforest remains unlogged. More than 30% of what remained standing in 1993 has been destroyed in just the last 25 years (684,000 hectares or 31% remained in 1993 and 469,000 hectares or 21% remained in 2018). Bolsonaro’s rise to power is a huge threat for the future of rainforests, biodiversity, Indigenous rights and our climate. It’s also a reminder that B.C. is not taking its global responsibility seriously. Like Brazil, we need to ensure intact rainforests remain standing before it’s too late. One step B.C. must take is to set a strong example of rainforest protection that respects Indigenous rights and title while creating new jobs through improved management of second-growth forests. The Great Bear Rainforest Agreements showed solutions for healthy rainforests and healthy communities are possible. Globally, the loss of primary forests is threatening species, carbon storage, clean air and clean water. 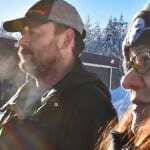 In Canada, this is mainly through the replacement of rich ancient forests with even-aged young forest. Vancouver Island’s old-growth rainforests are being lost at an alarming rate. Read more about this map and download a high resolution version here. On average, temperate rainforests store more carbon than tropical rainforests, helping to slow down global warming. When left intact, they are relatively resilient and less vulnerable to climate impacts such as fire and insect outbreaks compared to other forests. B.C.’s temperate rainforests represent the largest remaining tracts of a globally rare ecosystem, covering just half a per cent of the planet’s landmass.These big trees provide some of the best carbon sinks on the planet and irreplaceable long term economic value for tourism, recreation and businesses seeking locations with a high quality of life. 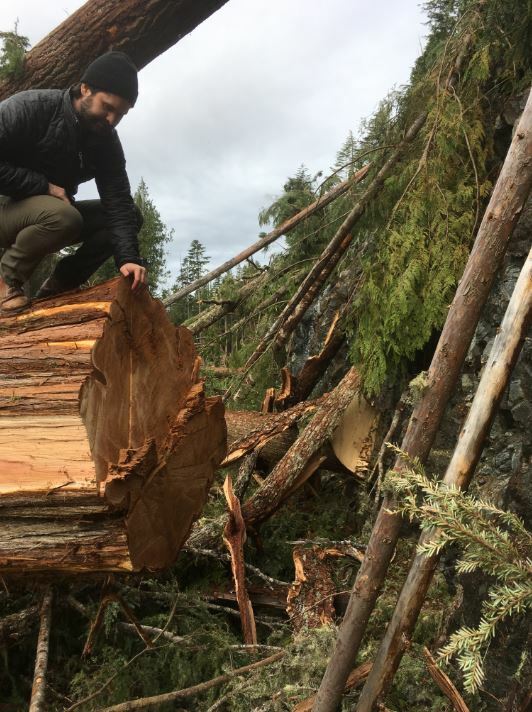 Yet the current rate of old-growth logging on Vancouver Island alone is more than three square metres per second, or about 34 soccer fields per day. Sierra Club BC, Wilderness Committee and the Ancient Forest Alliance, along with thousands of citizens, have called on Premier John Horgan and forests minister Doug Donaldson to protect remaining old-growth rainforests in areas like Schmidt Creek, the Nahmint Valley near Port Alberni and the Manning Park Donut Hole on the mainland. The B.C. government has ignored these calls to date. Without immediate action it will soon be too late to protect remaining intact rainforests and endangered ecosystems outside of the Great Bear Rainforest to safeguard threatened species, Indigenous values and a livable climate.